Facts about Pearscale Goldfish. The Pearlscale Goldfish has an egg shaped look, and many look like they swallowed ping pong ball. They can be a really good pond fish if you want. The only problem is unlike other pond fish, they are not very tolerant of the cold water, and should be kept in water temperatures of no less than 55 degrees fahrenheit. They are not a fast swimmer, Because of their round bodies. So you should keep them with similar goldfish (Calestails, Black Moors, lionheads, bubble-eyes goldfish ect. ), so they don't get bullied out of all the food. Pearlscale Goldfish grows some what large and requires at least 30 gallons of water if you want to keep it in an aquarium. The more room, the better, for your Pearlscale Goldfish. The Pearlscale Goldfish will eat most types of food, but you must restrict its diet some due to the unnatural shape of the fish's body. Since it is so rounded, the internal organs of the fish are very cramped inside its body. Their diet is that of Omnivore. A Pearlscale Goldfish should not be fed dry food that has not been soaked, such as pellets and flakes. Brime shrimp, bloodworms, daphnia, and vegetable food like lettuce and cucumber are also good for the fish. If the Pearlscale goldfish seems to have trouble swimming upright and is sidways, it may have swim bladder disorder, which is a common ailment for this type of goldfish. Also once a week feed Pearlscale shelless peas to prevent constipation and bladder disorder. If you Pearlscale Goldfish eats food that has not been soaked, the pellets or flakes will absorb water from the fishes internal organs and swell inside the fishes body. This may cause damage to the fish. You will need to purchase a liquid test so that you can test for Nitrates and Ammonia. The strip-style test kits are unreliable and a waste of money. You should use a dechlorinating product to remove the harmful chlorine from the water. Test for nitrite, ammonia, and proper PH. Water Conditions should be 65-75 Fahrenheit, KH 4-20, pH 6.5-7.5. The ammonia should always be 0, and the nitrate should be below 20. If it's at or above 40, you have too many fish or are not changing the water frequently enough. Doing weekly water changes, once a week, remove and replace 30%-50% of the water in Pearlscale goldfish tank. Perform a thorough gravel cleaning once every 2 weeks or so. you need to use a gravel vac which vacs up debris while removing water and cycling it back to your tank. With tropical aquariums, it is often recommended that you do this once a month, but with goldfish (who produce an absurd amount of waste) you will need to do this as frequently as you can. Once a week, once every two weeks, or once every three weeks is the minimum. Removing all the water from the tank will damage the bacteria that has grown that helps decompose the fish waste. The Pearlscale Goldfish makes a lot of waste, and should be feed several times a day in small portion, the goldfish doesn't have a stomach that is why you should not over feed, they should not be kept in less than 30 gallons of water. 30 gallons must be the least amount, and the more room you can provide your Pearlscale Goldfish with, the better the fish will live. So you should keep your Pearlscale Goldfish with other Celestial Eye goldfish, or with other fish with equally poor eyesight such as Telescope Eye Goldfish and Bubble Eye Goldfish. 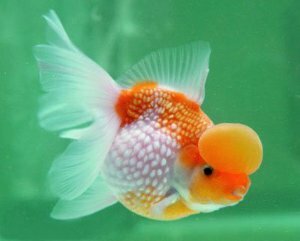 Don't put plants or ornaments with sharp edges in the aquarium or pond, since the Pearlscale Goldfish can easily damage its eyes on sharp objects. You should make Filter intake tubes covered in aquarium sponge or something comparable to the sponge. You need the proper filter. Goldfish create a lot of waste and are known for being messy. your filter should completely clean the water at least ten times an hour. If you have a twenty gallon tank, you will need a filter that can handle the waste of at least 200 gallons per hour. A filter that cleans more than ten times the amount of water in the tank is more than adequate. Get coffee bean sized gravel for the bottom of the tank (if it is any smaller the goldfish could accidentally swallow some while feeding). Make sure any rocks or gravel are metal-free, since rocks with metals can harm fish by leaching toxic residues into the surrounding water. To decorate your tank, Buy a few ornaments and decorations and fake plants. Do not buy ornaments with openings small enough that the fish can get stuck in them. Remember to consider how large your goldfish can get. Cycling your tank is important, Follow the steps to cycle your tank. This establishes healthy bacterial and chemical levels. When buying your Pearlscale goldfish see which ones look like the healthier ones. Be wary of tanks with dead fish in them, as this can be a sign of illness or improper care. In addition, healthy fish will have no white spots, swim with their fins held upright, Have a nice rich color or colors. Not be afraid of people, they should swim around all over the tank and look healthy. Add the Pearscale goldfish to the tank. It is important to introduce the fish to the tank environment slowly. As soon as you get home, float the entire, closed pet store bag (with the Pearlscale goldfish inside!) in the tank for about half hour. This will allow the water in the plastic bag and the fish is in to equal out to the same temperature as your tank. Next, add a small amount of water from your tank to the bag, and wait about 15 minutes. Do this at least one more time. Dispose of the water down a drain or outside. Then, use a net to transfer the Telescope Eye goldfish fish carefully into the your tank. Dispose of all of the water in the bag. This process not only reduces stress for you fish, it also prevents the dirty pet store water from contaminating your tank. Clamped fins are a sign of illness.